Marketing automation uses software and marketing techniques to automate a series of marketing actions and optimize their effectiveness. By cross-referencing data related to their contacts' behavior - pages visited, actions on the website and reaction to communications - marketing managers can personalize their communication even further. By automating their communication strategy, they save time and their communication is more effective. Marketing automation is often used for lead enrichment, with the aim of converting the lead into a customer. At the same time, it is important not to limit MA to this use. It is always more profitable to enhance customer loyalty or increase the average size of an existing customer's shopping cart than to win a new one. So, marketing automation must be viewed as a whole and not with the sole focus on conversion. We are now going to see exactly how the SendinBlue marketing automation platform works. To target your communication, you first need the elements that allow you to do this. In short, you need to know your contacts. The first step vital to any further action is to identify them. For this, we are going to provide you with a few lines of code to integrate into your website. As soon as one of your contacts clicks in an email you have sent them, we leave a cookie that can identify the contact from their email address. The limitation of this cookie is that it can only be used with contacts who have clicked in one of your emails. To extend tracking to all of your visitors, you can add an identification request or Identify User (click here to find out more). This functionality allows you to add selected attributes when your visitors are identified, and then create very personalized workflows. Now that you know how to identify your contacts on your website, you can follow their actions. There are several different types of tracking. The code you have copied onto your website already contains a script to track page visits. You can edit it to personalize it even further. Click here to find out more. If you use the subscription form provided by SendinBlue, subscription tracking is done automatically. If you use another type of form, you can always track your subscriptions using custom tracking (see 2.4). You can identify the important links on your site to better understand your contacts' actions. This tracking requires additional configuration. Click here to find out more. If you wish to go further and track specific events on your website, please click here to find out more. For example, you can track your customers purchases on your website. All the information you have on your contacts will then allow you to create workflows that are all "specific routes" in which you can intervene. So, a workflow contains an "entry point", the contact's required point of entry into the route. This route can then be interspersed with steps that you specify and based on which one or more actions are carried out. Click here to find out more about building a workflow, and here to view some examples of workflows. 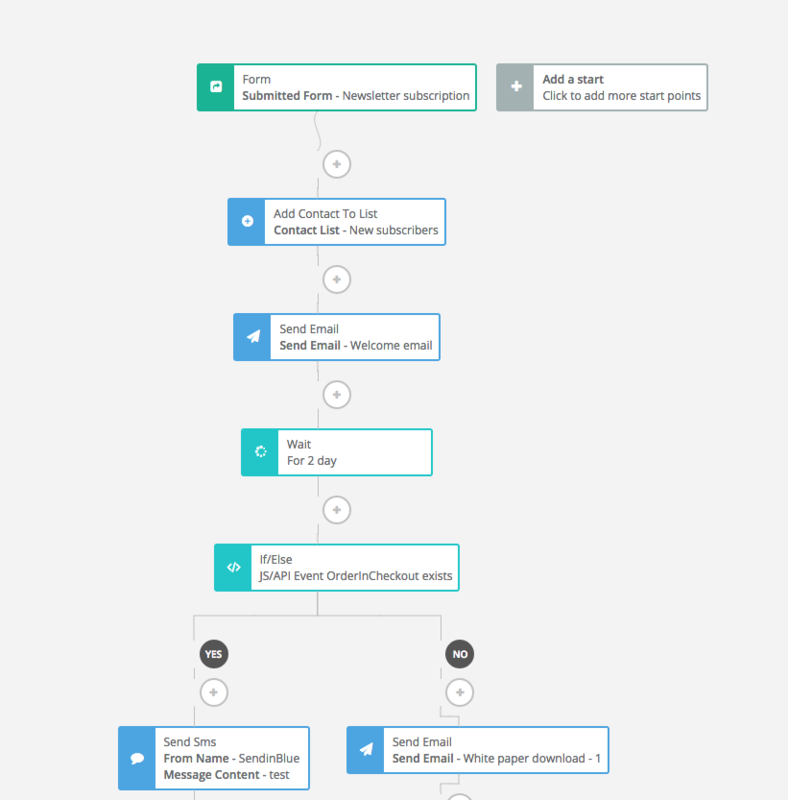 Once these workflows have been set up, your ultra-targeted and relevant marketing campaigns will be generated automatically. You can keep track of the overall performance indicators on your dashboard. "Contacts in workflow(s)" calculates how many contacts are currently part of a workflow. "Targeted contact(s)" calculates how many contacts have been targeted by actions anticipated in the workflows (email or SMS sent, added to a list, etc.) during the course of the day. "Emails sent" and "SMS sent" refer to the number of emails and SMS sent via the workflows. Finally, the "Logs" tab allows you to view all tracked events and actions generated by the workflows you have set up. You can add a filter by date and by event/workflow type. What behavioral data is uploaded to SendinBlue Automation?